I love photographing wildflowers for two main reasons – they don’t complain about me photographing them, and I often get to capture the dance of life in and around them. Over the past 20 or so years that I have been actively hunting and photographing wildflowers, I have had the pleasure to encounter a variety of fauna – some of it wild and some of it domestic. One of my favorite encounters is to find a spot that has a good coverage of wildflowers and lots of bees and butterflies. I’ll sit down as close to the action without disturbing the flowers or the critters. As I wait quietly, soon the bees and butterflies get used to my being there and they will come and land on the wildflowers right near me. This is so cool and exciting to get an eye-level of the dance of life that sometimes I will just sit there watching without taking one photograph. 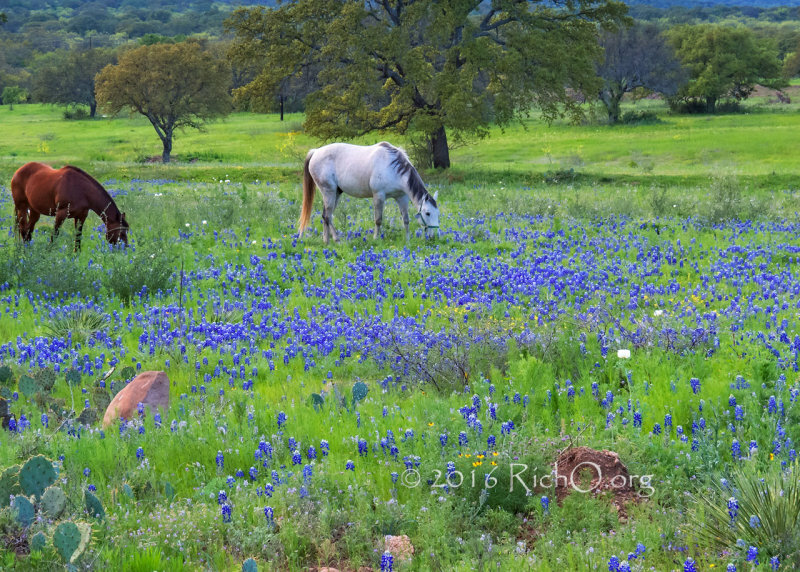 Because of the many less traveled county roads in the Hill Country, it is my favorite area in Texas to find and photograph critters with wildflowers. The Hill Country has so many different landscapes with hills, valleys, creeks with meadows, and rocky out crops. These out of the way county roads provide spots where you can park the car safely and walk along the road to find a quiet shady spot to sit and watch life dance by. And there are a number of Texas State Natural Areas and Parks that give you off-the-road access with hiking trails to some unique secluded spots. If you go during the week, you are more likely not to run into another soul also looking for solace and solitude. 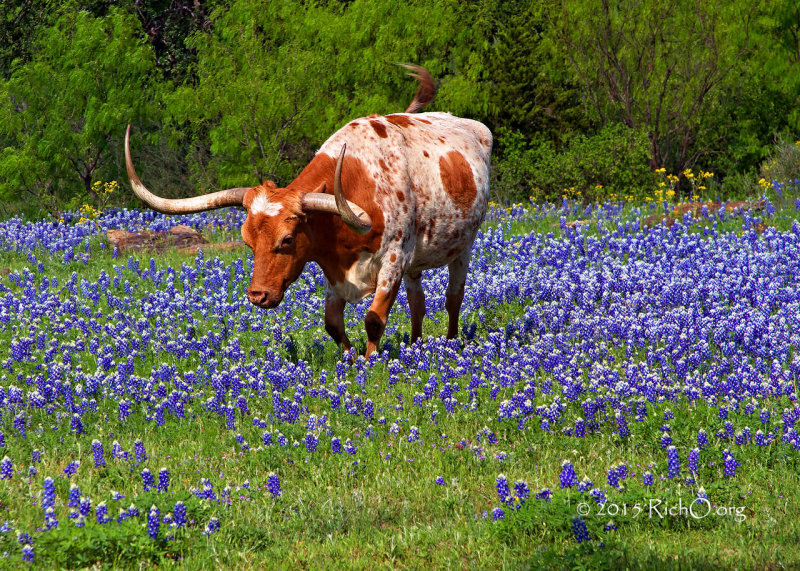 Longhorns – probably the most iconic shot that everyone wants to capture are longhorns in the bluebonnets. And there are several locations where you are more likely to find them. Southeastern part of Llano County along one of the county roads. Horses – the second most iconic shot are horses in a meadow or pasture of wildflowers. To me it is so sublime and peaceful to watch a horse grazing between the wildflowers with the golden rays of a setting sun glistening off the horse. Cows and Cattle – Before there was oil, Texas was one of the kings of cattle ranches. Large ranches of Hereford, Angus, King Ranch Santa Gertrudis, Brahman and of course the Longhorn cattle stretched from the coastal areas north to the Red River. And let’s not forget the many dairy farms with Holstein, Jersey and Guernsey cows. Goats and sheep – Not the best friends of wildflowers. Usually, where you find goats or sheep, you will not find many wildflowers. This is especially true of goats. Unlike cows, goats will eat many of the species of wildflowers right down to the roots if they are on overgrazed land. 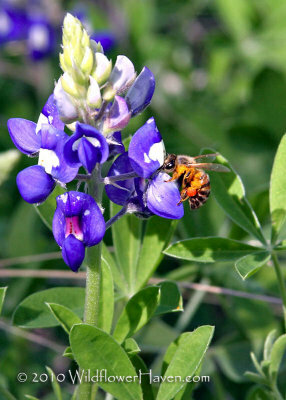 Bugs, spiders and flying insects – When you find that spot where you can get up close and more than personal with the wildflowers, you will find all sorts of bugs, spiders, and flying insects who also appreciate the color and bounty the wildflowers provide. Butterflies – From tiny Sulphur, to the Giant Swallowtail you will find a wide variety of butterflies enjoying our wildflowers. Texas is right in the midst of the main migration paths for Monarchs, so twice a year we get great opportunities to capture photos of them on wildflowers. Jackrabbits – You have to be quick to capture on of these in the wildflowers. Snakes – I have been lucky to only find dead rattlesnakes, but I have seen rock snakes. Field mice – Spotted one peeking out from a clump of wildflowers while I was trying to photograph the eagles along Texas 29. Deer – You do not want to run into these at dusk or night while traveling home! During the day, they usually stay away from high-traffic areas. Wild Turkey – I usually will see these in the fall, but have spotted them at other times. Armadillo – Hopefully, you see them alive and foraging for grubs and not as road kill . Road Runner – You might get lucky and be able to photograph one of these iconic Texas birds in the wildflowers, but you better be prepare to shoot quick!